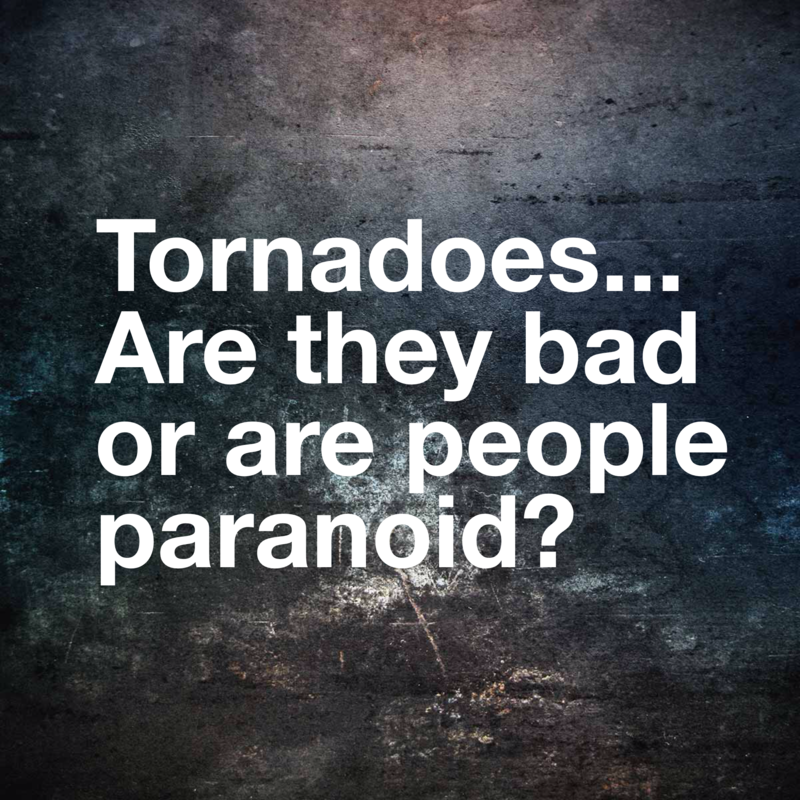 Tornadoes... Are They Bad or are People Paranoid? Now and then amongst the unwanted, poorly pitched info graphics that don’t suit this blog’s content, the contact page results in real conversation with someone. This week, one of those strikes me as something I may want to share here. Hope you find it of interest. Here is my response. I would love to hear how you would answer in the comments section. You are smart to be considering various pieces of a move but tornadoes isn’t something that would keep me from living in a place. I lived in northwestern Oklahoma four years and can’t recall a single tornado. I have friends who have lived incredibly close to destruction when one hit and yet they are fine. I have lived in several states that have tornadoes and would suggest the best path is to learn more about how to stay updated on severe weather & what to do if you find yourself in the path of a tornado. Remember not everyone takes severe weather seriously so the people who take video rather than taking cover may be more adventurous than others, they may also be at greater risk. I have the weather app on my phone that alerts me to bad weather but additionally cell phone companies send alerts within specific areas. I take them seriously. When I get one, I take cover. Where I currently live, that means the basement. In a previous home it meant the interior closet. I take my cell phone with me, grab a pair of shoes and sometimes a jacket. I don’t go to the front porch or backyard to take video or photos to share on social media. As an Okie, I’ve heard that a lot. However, as disasters go, I choose tornadoes over hurricanes and earthquakes. Tornadoes are scary but kill few people and, in fact, can come directly through a large city and miss almost everyone (On TV you see the swath of destruction, not the thousands of homes on each side that are fine). Warnings generally give you plenty of time to take appropriate action and have become very precise. After a tornado, we have highways, transportation, hospitals and many, many unaffected people who can assist others. Hurricanes and earthquakes, on the other hand don’t miss anyone. I hate saying I agree with you Ken 😉 . Hurricanes are something that seem so wild and powerful as do earthquakes but neither would stop me from moving someplace. My sister was in Japan when a major quake hit — it actually left her needing a new place to live. My other sister has weathered several hurricanes. It is hard to imagine I’d let weather totally rule my decision but then again, I don’t plan to move to North Dakota due to my dislike of extreme cold! It’s all about what you grow up with and what you’ve experienced in life. Everyone in the Midwest cites the fact that tornados are no big deal compared to the earthquakes CA gets. I grew up with earthquakes and although they come unannounced, they aren’t something that scare me. A tornado I can certainly track and watch form but it scares the Jesus out of me. While I wouldn’t say that I wouldn’t move simply because an area gets tornados, I would never take them lightly. They are certainly a reality that can happen. Educating yourself is so important to survival. Knowing where to go in your home, what to bring, and how to track a tornado are all great things to know if you’re going to live in an area that is prone to tornados. Agreed. I think familiar is easy and the other have to be managed. As you can see above, I have friends who really worry about earthquakes and hurricanes but my family has experienced both and lived to tell the tell. Getting pepared is the key in my mind! After moving to tornado country from earthquake country, preparation and a plan is key. I probably am in the few that has a complete tornado kit prepared (even have stuff for our cat in there, and wine :)), but in the event we needed to get somewhere fast it has everything we need for a short time period. A couple of years ago we asked for a fire safe. We keep all of our very important documents in there (specifically immigration ones for the Hubs), this is also reassuring knowing that if an event happens those documents will probably be safe. Also, since I travel a lot for work, my husband and I have a plan in case we are separated during an extreme weather event – which gives us both peace of mind. You make some great points! A fire safe is a great idea. If you don’t already have your name, address & phone number on it, you may want to — permanent marker or something right on the outside. And I tend to have a tornado kit in the basement too…. need to check it for the key items. For me, I put in the things you mentioned as well as a combo car/wall phone charger. I keep those things charging throughout a storm just in case. Good note on the plan for if separated too!